I always love doing exercises. Sometimes I do them based off photographs. Sometimes I do them based off phrases or a series of words. I thought I would do something a little different and try an exercise based off an image and random words. Here’s an image I found at Office.Mircrosoft.com. I then picked up a random book and flipped through it picking words until I had six random words; happy, shape, wasp, friend, object, and dead. Now I was ready to be inspired. Here’s what I ended up with. The peacock eyed a wasp as it floated closer to him, the insect oblivious to the proud bird and the ladies he had come to court. The peacock fanned out his feathers of cobalt and sage not happy about the disturbance to his domain, as well as to impress the watching ladies. He strutted across the lush grass, casting a defiant shape. The wasp buzzed in closer. A loud caw erupted from the bird as he moved in toward the insect, showing off his bravery to those who watched. And then quite unexpectedly the wasp fell to the ground dead. The peacock noticed for the first time that a tall gangly creature stood with a cylinder object in an outstretched limb. The object glinted in the sun just before the gangly form tucked the cylinder away out of sight, then walked away on two long legs. The ladies seemed impressed by this feat of killing the insect. 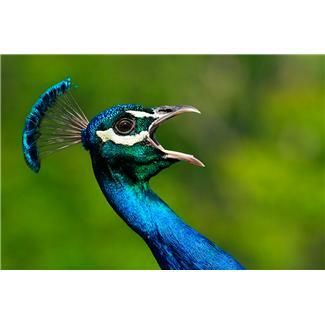 Each of them opening their beaks to express their pleasure at the peacock’s supposed kill. The bird ruffled his feathers at the attention and stood even prouder than before. He fanned out his colorful plumage strutting away, but this time when he opened his beak, a benediction of regard floated across the afternoon air toward the gangly creature that always seemed to be around to deliver what was needed. The creature often brought food and water to cool his thirst. And now the creature had delivered him a moment of admiration from his ladies. What better friend could a peacock have? Okay. Your turn. What will this exercise inspire you to write? Feel free to post your results below. Thank you! Glad you enjoyed it. I’m planning another blog similar to this later this month. I’m having a difficult time selecting between BlogEngine/Wordpress/B2evolution and Drupal. The reason I ask is because your design and style seems different then most blogs and I’m looking for something unique. I use WordPress and I love it very much! I recently switched to WordPress about 2 months and think it’s the best decision I ever made. Not only is WordPress better about keeping track of blog traffic, it’s also has a variety of design templates to chose from. I did do some customization to my blog (including adding the picture of the butterflies that I created in Photoshop at the top of the page), but it only took a matter of an hour or so of setup to create this blog and transfer my files from my old blog on Blogger. So yes, I’m a big fan of WordPress! Thank you. I’m glad you like what I do. I try to keep it fresh and I usually write about what interests me in the moment I sit down to write a blog post. I would like to post more, but find that once a week is my max for now. If I did more than that, it wouldn’t leave much time for my fiction writing. As it is, I try to write my blog posts in advance and post them regularly through the month. So in reality, I sit down a few days at the end of a month, decide what posts I want to write for that month, and then schedule them at regular intervals. Then I have the rest of my time to focus on my other writing. litte more on this subject? I’d be very grateful if you could elaborate a little bit further. Bless you! I’m glad you were intrigued to ask for more. In fact, I am planning another sister post to this later this month with yet another writing exercise. It will post on the 19th. Hi it’s me, I am also visiting this website daily, this web page is in fact nice and the visitors are actually sharing good thoughts. Thanks for the follow! It’s appreciated. I hope to keep your interest. If there is a topic you’d like to see me write on, don’t hesitate to ask. Sometimes I struggle for post ideas, so new ideas are always welcomed. Hi, Neat post. There’s a problem together with your site in internet explorer, would check this? IE nonetheless is the market chief and a huge section of other folks will omit your great writing due to this problem. I just switched over to Internet Explorer (I usually use Firefox) and checked this site. I didn’t see anything wrong. What was the nature of the problem? Maybe my eyes just didn’t catch it. post. They’re really convincing and will certainly work. Still, the posts are very quick for beginners. Could you please prolong them a little from next time? Thanks for the post. Yes. This was a quick post. I have done many other blog posts on writing exercises (they are in the archives), so I didn’t feel the need to explain more. But since I’ve had a lot of comments on the brevity of the post, I have a much longer post on writing exercises due to be posted on August 19th. could write a litte more on this topic? I’d be very thankful if you could elaborate a little bit further. Cheers! Check back August 19th. I have a post coming up called Writing Exercise: Blue Moon that is much longer and more in depth about writing exercises. Thanks for your interest. I understand. What I did in this writing exercise is the accumulation of years of practice in writing. The sort of exercise combination done in this post is usually reserved for those with more writing experience. Instead of using the combination of words and photo, you can just use the photo as a prompt, or use one or two of the words. Writing exercises are meant to be fun and inspirational. If something is beyond your comfort level, then tailor the challenge to a level you can realistically aspire to, and know that one day with plenty of practice, the more complex exercises will become easy to do. The more you write the better you get and the easier it is to create a story from different prompts, information, or ideas.